This article features a work in progress code proposal. A work in progress code proposal is incomplete, but is being actively worked on. The proposal may be in various stages of development, from a somewhat organized idea dump to a fully-formed proposal that just needs a quick spell check. This document proposes how the implement primary, secondary character stats and skills, as documented in Character_generation_and_stats. Instances of this class provide the general information (name, description, ...) about one primary statistic, secondary statistic, or skill. Instances of this class represent one primary statistic, secondary statistic, or skill of one particular character (player character or NPC). Methods: addModifier(key, modifier) and removeModifier(key). This method will behave like a number, by implementing __float__, to make calculations easy. This is a subclass of StatisticLevel, only used for skills. 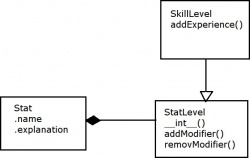 SkillLevel has an additional method to add experience, where addExperience(1) means "add an average amount of experience". Note: a skill is considered a kind of statistic, because a skill has all the properties from statistic. This is class calculates the secondary stats, based on primary stats. The above skill classes will allow us to implement the statistics system in a simple way. This implementation uses little inheritance. This page was last modified on 3 February 2011, at 10:03.